Move over chicken noodle soup! Move over beef stew! This Swedish Meatball Soup has y'all beat! I am really digging Swedish meatballs lately. We've had them over mashed potatoes and in soup and yum! I just can't get enough! It was such a nice change of pace to have a beef-based soup. I feel like all the soups we eat are chicken or meatless. If you all have a great beef soup recipe, definitely leave me a comment below and a link to the recipe because if it's one thing I can't help, it's to hoard more recipes! This variation doesn't add any time to making a burger, but it sure does blow a regular burger right out of the water! We have burgers every other Friday, so I'm always looking for different kinds of burgers to make. Some are pretty labor intensive while others, like this one, are simple tweaks that really make the burger quite different. You prepare the burger much like you would any other...form your patty and cook it. The cheese of choice (weapon of choice har har) is mozzarella and you top the burger with just tomatoes and pesto. It's all very simple, but outstanding in flavor. You can make your own pesto or buy some at the store - it's up to you. I served mine up on crazy good butter buns! I cannot believe that Thanksgiving is gone already. It was so weird for it to not be absolutely freezing out. We got our Christmas tree up last night after all our family members that were in town had left. Excited about this week's recipes. So many goodies! I have been participating in a fun shindig called "Countdown to..." each year since 2011 to round up my best/favorite recipes from the year from my blog. I joined other food bloggers in this really fun activity, sharing round ups from Dec 26 until Jan 1 to ring in the new year. This will be my third year hosting it! In the Countdown to 2017, you will round up your best and/or favorite recipes posted in 2016 for each category on the specified days and link up to the blog hop. You don't have to participate every single day, but can join for however many days you want. Each blog hop will open at 12am EST and close 48 hours later. 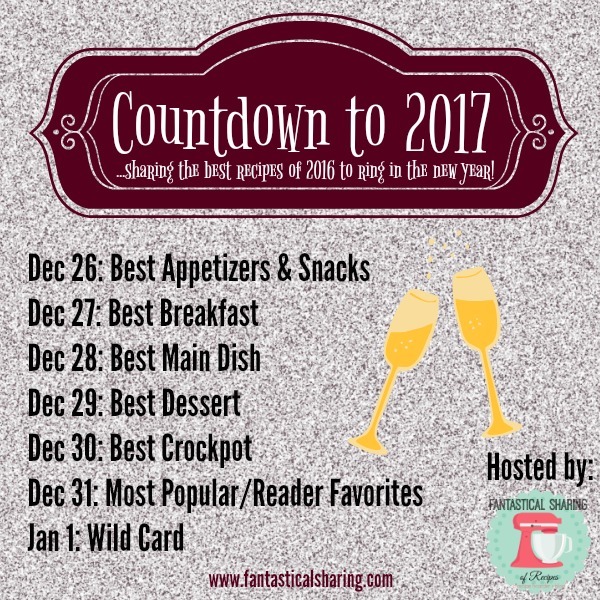 The first of January is a "Wild Card" category where you can choose what you want to share, whether that be your favorite recipes of 2016, your family's favorites, a list of recipes you want to try in 2017, beverages, etc. If you have any questions, please email me at fantasticalsharing1 at gmail dot com. I'll see you back on the 26th for the first Countdown to 2017 post all about the best appetizers and snacks recipes of 2016! Sign up for the mailing list is below the image at the end of the post. Please feel free to post on your blog about the Countdown or share the button on your sidebar or one on your social media. To save, right-click and upload from your computer, tablet, or phone. Do not copy/paste. Sign up for the mailing list: here. A delicious cheesy potato soup fixed in the crockpot with ground beef and topped with all the best hamburger toppings! I love a good potato soup and I love when one is more than just potatoes. Don't get me wrong...plain potato soup is great and hearty and wonderful. But add ground beef and cheese and then all the right burger toppings and it is just out-of-this-world delicious. Although this is a slow cooker recipe, it does require dirtying one skillet to cook the ground beef and also make a cream mixture to help thicken up the soup. I personally don't think that's too horrible of a trade off and really loved this soup. I went super heavy handed on the toppings and it was just so good. So so so good. These impressive enchiladas have the perfect balance of everything with homemade salsa and cool and spicy pico de gallo. Sometimes I will put off making a recipe because I think it looks really complicated and like too much work. I find it pretty funny that I will take the time to measure out what seems like at least a dozen spices for Skyline Chili, but I can't chop up a few things and stir them together. So I've been trying to look at recipes and estimate the time it would take to make that recipe and TRY my hardest to plan it on a day that doesn't have too much going on. This recipe had me stupid excited because I love homemade salsa and I never get to use poblanos because I will plan a recipe and then my chosen grocery store will be out of them. I was pretty stoked that the store had poblanos and I was able to make this recipe because YASSSSSSSS. First off, this poblano salsa is not only tasty but super duper gorgeous. Look at it! It is LITERALLY (Chris Traeger voice) the icing on the cake...but pico de gallo on the enchiladas. It's so so wonderful. It's both cool and spicy and I could eat it by itself. It's amazing. The entire combination of the enchiladas, salsa, and pico is incredible. I can't get over it. One of my favorite favorite holidays ever is Thanksgiving because I love that it's a food holiday and a family holiday. It's just a big family feast and that is THE BEST, if you ask me. This year, we are going to do pot roast with a little turkey on the side and we're going simple on the food side of things. Last year, there was a lot of extended family in town, so we made a LOT of food. We still will have a crowd this year, but we won't be doing two kinds of potatoes, plus tons of sides. We're keeping it simple :) My mom's birthday falls on Saturday after Thanksgiving this year, so I'm making Junior Mint Cupcakes for her because she LOVES Junior Mints. Simply set these aside to rise and brush with a delicious honey butter before baking for 15 minutes and you have the most addictive dinner rolls ever! Today is SUCH a sad day. It is my final Secret Recipe Club reveal -- and the final SRC reveal for the club as well. Over the past 5 1/2 years, Secret Recipe Club has connected food bloggers from around the globe in a Secret Santa exchange of sorts. I joined when the original owner, Amanda, added a fourth group because of the influx of new members. Over time our numbers have diminished and although it would seem like the smaller the number the easier it is to run, it's quite the opposite. So instead of letting us dwindle down, I thought it would be best to go out with a bang! So while it is sad that the Secret Recipe Club is ending, I'm so happy to have been a part of it and to have met so many great blogging friends along the way. We're keeping the blog alive to share blogging events that our alumni may be hosting or want to share and staying connected with each other. 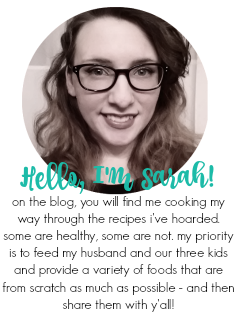 This month, I was assigned to Erin's blog, Table for Seven. I believe I found Erin's blog in the early years of SRC and I was hoping to get her blog, but then she did leave for a while and I was so bummed. Then she came back and I was super happy to hopefully get the chance to feature her wonderful blog! Erin is a mom of 6 (she has a blog about her angel, Eliza Hope) and has been married to her husband for over 15 years. 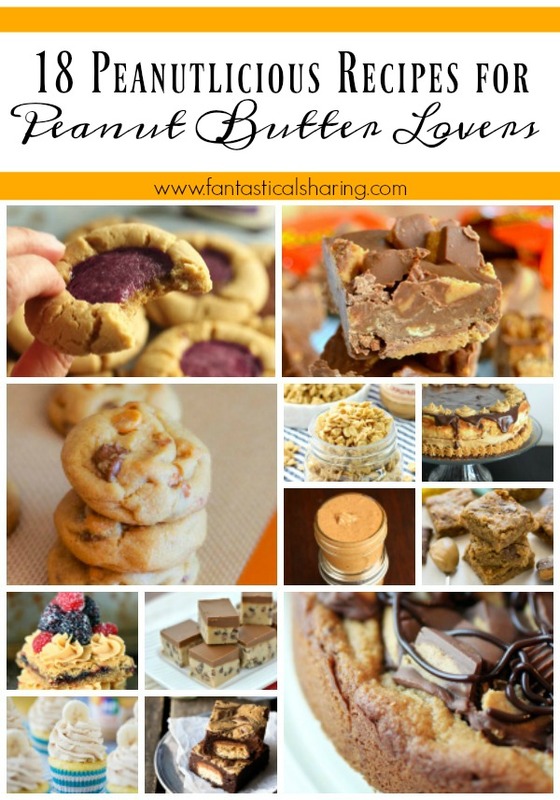 She has a million recipes on her blog that I want to try, but I did narrow it down to some sweets: Cinnamon Sugar Popcorn, Chocolate Eclair Cake, Chocolate Rolo Cake, Pumpkin Nutella Cookie Bars, and Chocolate Chip M&M Cookie Bars. But ultimately chose to test run a recipe for Thanksgiving: Honey Butter Rolls. I went to go make my grocery list and add the ingredients needed -- and to double check I had the essentials for the bread dough when it turns out these are 3 ingredient rolls and I had all three ingredients on hand. I love shortcut recipes and even more so, I love using frozen bread dough for different things. These were so delicious! I typically don't like honey, but mixed with the salted butter was just the right hint of sweet. And although they aren't necessarily fast, they are really low hassle to make and would be perfect for if you already have a full menu of food to make - especially on a busy holiday like Thanksgiving! You can set them aside while you cook other things. Bonus: the kitchen will be the perfect warm place for them to rise. Then when the meal is almost ready, these little rolls only take about 15 minutes to bake. 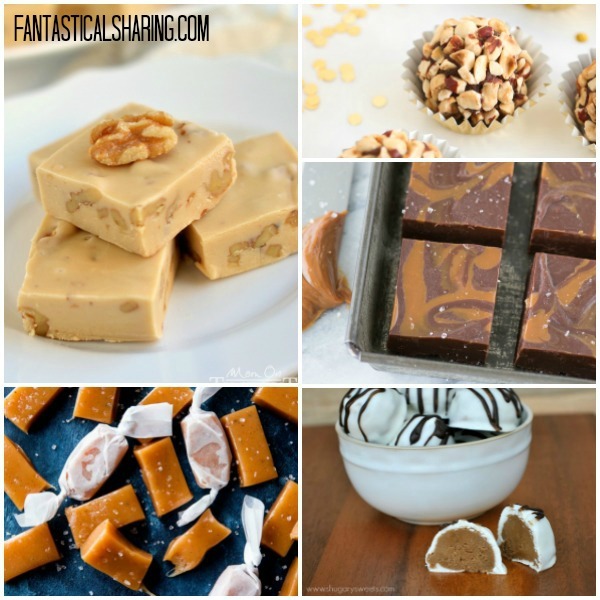 The month of November is Peanut Butter Lovers' Month, so I thought it would be perfect timing to share a ton of peanut butter recipes! This soup is so lovely and it reminds me so much of minestrone! I saved this soup when I was assigned Wendy's blog for Secret Recipe Club. She actually had plenty of soups that I wanted to try and have and you will see them soon (hopefully). I picked this recipe because I don't eat as much ham as much as I'd like just because of lack of recipes saved. I also had never had barley and always wanted to try it. This soup was fantastic and really reminded me of minestrone with the tomatoes, zucchini, and oregano. It was a delicious dinner and we will most definitely make it often for our weekly soup nights! Who knew deviled eggs could get even more devilish? These fried deviled eggs are a treat! I am so excited to be hosting a new blog event that is low-pressure and much like one I participated in way back when I was first blogging (Crazy Cooking Challenge) and it is called Fantastical Food Fight. It is open to any bloggers that would like to join in. We have an ingredient or specific dish theme for each month and will all make recipes to fit the theme! You can read up on the details and sign up for the mailing list here. Our first post theme is DEVILED EGGS -- just in time for Thanksgiving! I thought that I had a ton of deviled egg recipes on my pin boards...and then it turns out that I really didn't. I made Jalapeno Popper Deviled Eggs last Thanksgiving and they were SUCH a hit. So I felt like I wasn't going to really find anything to top those....and then I found Fried Deviled Eggs. Oh yes, fried. I figured why not. So I wanted to do a test run before committing to making a ton for Thanksgiving. In my opinion, these are best for small crowds and served fairly fresh out of the fryer. This recipe comes from Pat and Gina Neely and can be found on the Food Network website. I personally think they taste like a fried egg sandwich :) I did a half batch, but will share the full recipe. Be sure to stop by my fellow Food Fighters' blogs linked at the bottom of the page. I'm so excited to see what variations of deviled eggs they have in store for today! And stay tuned...next month our theme is Shortbread Cookies! I took my mom's classic breakfast recipe and added pumpkin pie spice, pecans, and sea salt to the mix and it was absolutely the best decision ever. These caramel rolls - whether they are this version or the original - they don't last long at all. The bread dough is fluffy and oh my goodness gracious, fresh out of the oven, they are heavenly. Not too much longer and it will be peppermint time, so I'm trying to get all my pumpkin cravings sated. I absolutely loved how the bottom of the pan looked before adding the rolls! I cannot believe next week is Thanksgiving. This week is kinda "fast food" heavy and I didn't realize it until just now, but we have KFC, Taco Bell, and Skyline copycats plus a little Red Lobster in there too. What are y'all eating this week? A classic with a twist, this pie is especially a treat for anyone who loves butterscotch! Today's Sunday Supper event is HOLIDAY DESSERT RECIPES and is hosted by T.R. of Gluten Free Crumbley. I very rarely post recipes on the blog that I don't like....because usually that means I have made something that was NOT edible. However, it's quite the opposite in this case. I am not a particularly huge fan of pecan pie. As in, I don't eat it and won't eat it. Ever. I really just don't like pie very much, but if the filling is good, I will eat the filling and not the crust (like you would a pizza). I made this pie for Nick because pecan pie is his favorite and he loves butterscotch. Fortunately, I am apparently really good at making pecan pie because Nick LOVED it. I did test a bite thinking maybe the butterscotch would make me like it, but I was wrong. For someone who has a whole set of sweet teeth, you would think I would love something so sugary and sweet, but alas, this is just not my thing. I feel bad because I'm badmouthing this recipe, but if you like pecan pie and butterscotch, you will LOVE this pie. LOVE it. Plus it's nice to have a slight twist on classic foods at the holidays. Leftover turkey made into a comforting casserole dish. First and foremost, thank you, Veterans. Thank you. Today's recipe is for the very quickly coming up Thanksgiving and more importantly, the leftovers! We typically like to use our leftovers in a cheese tray fashion for our movie night where we watch a long series of movies on Thanksgiving evening and fall asleep during the first one of the series. It never fails. Last year, we attempted Pirates of the Caribbean...and I don't remember seeing any more than 10 minutes. We did have a little more leftover turkey and I decided to try a different tetrazzini recipe. What I mean by different is that my mom-in-law makes incredible tetrazzini and even though she gave me her recipe, I have never been able to make it correctly. I'm cursed. This tetrazzini recipe is a little different than my mom-in-law's and I also tweaked it a lot to meet what I had in my pantry. It was a great dish and tasted almost like my mom-in-law's and I didn't mess it up, so that was good enough for me! I never in a million years thought I would like this RANCH STYLE SPAGHETTI, but I absolutely did. It was such a surprising punch of flavor. Only six ingredients too! And this recipe is one of the best recipes in my arsenal: PIZZADILLAS. We are actually having it tomorrow for dinner because it is easy to do and super yummy. It's a nice alternative to pizza. Take a step on the wild side with this amazing and unique soup! Sometimes I see recipes that look super out there and I don't hesitate to make them. It makes me proud because I don't think I would have done that a few years ago. This recipe for Dill Pickle Soup is one of those recipes. If you have read my blog for a while, you'll know that I don't repeat recipes often and had to incorporate Throwback Thursday into my meal plan where we have old favorites on Thursdays. Someone shared this on Facebook (a blog page, perhaps?) and I made it the following week -- which is also a rarity. I try to make the oldest recipes in my stash first. Anyways, I was so curious about this soup recipe and dying to try it, so I did. I didn't really tell any of the family that it was happening until they were all over for soup night. If I remember correctly, my mom-in-law and a few, if not all, of my husband's siblings and significant others came for dinner that night too. So it was nerve-wracking to say the least. Thankfully, they were all good sports and trusted me to not make them a bad dish. This is probably my favorite soup now. I've made it two or three more times since the first time and I crave it all the time. It's basically a very dill-ish potato soup. The bite of sourness is just the best thing in the world and there were NO complaints from the family. They all really liked it. If you love pickles and dill...MAKE THIS SOUP!! MAKE IT!! I absolutely love dill pickles and so does a lot of the family, so it was a no-brainer that all of us would like it...a lot! 6 ingredients for this quick lunch that tastes amazing and fills your belly! This week I am remaking a recipe for a better picture and hoping to make a few that I have actually had on the menu previously, but never got around to making. What are y'all having to eat this week? A sneaky way to add green veggies to your pizza - add it to the dough! I am very fortunate to have kids (or at least the two oldest kids) that are pretty okay with most vegetables. They like kale, love broccoli, and will even tolerate brussels on occasion. They'll eat fresh spinach salad. So I don't ever really have to sneak vegetables into anything. They did give me some really questionable looks when I made this recipe though. 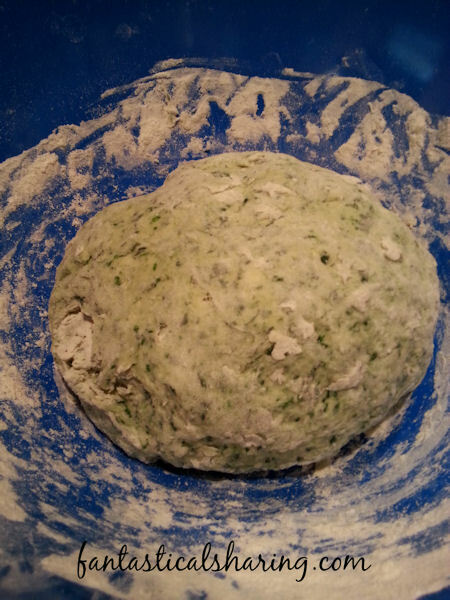 They did not get the need to add spinach to pizza dough. However, thankfully, the side eyes stopped when they ate their pizza and couldn't taste the spinach. The recipe itself is actually very similar to my go-to pizza dough recipe and I think that's how I got away with it. I thought it was a great pizza dough. I mixed it by hand but will try my stand mixer next time! This yummy gnocchi soup is wonderful for chilly fall and winter nights. Last week, I posted my soupless soup...this time, my soup looks VERY soupy. I don't mind having lots of broth in thicker soups like this one. And my poor gnocchi looks MIA, but I promise it's in there and hello, what a wonderful take on potato soup! I like that there is no cutting potatoes, you just throw the potatoes (gnocchi) in. So in a way, it's like a lazy potato soup, but you can pretend it's fancy potato soup LOL. This is not just a Frito pie -- it's Knoxville's gourmet version and you have got to try it! I am unbelievably excited to share this recipe because it is native to my hometown: KNOXVILLE!! :) In 1982 at the World's Fair, a couple from Spokane, Washington decided to make a gourmet version of a popular football treat: chili and onions poured over corn chips (in the bag). Joe and Carol Schoentrup added cheddar and Monterey Jack cheese, tomato, green onion, sour cream, and hot sauce to the chili, onions, and corn chips combo. The World's Fair had an energy theme that year, so the dish was dubbed a "Petro" as a nod to petroleum. The Petro's Chili and Chips "restaurant" started up in a food court in our very own West Town Mall in 1992. It's a really small chain, but I honestly didn't realize it was a Knoxville thing until I went to make this recipe. I first visited Knoxville when I was in 4th grade - back in 1998. We came down to visit my stepdad's family for Christmas. I remember getting Petro's for the first time (and Baskin Robbins) and it being the best mall food I had ever had. I thought having chili over Fritos was GENIUS. I still think so. I haven't had a legit Petro in years upon years, even though I have lived in Knoxville around 11 years (minus the 6 or so years I missed due to military life). I knew it'd be like pulling an arm and a leg to get Nick to choose Petro's over anything else if we ate fast food, so when I was craving it, I decided homemade was the way to go. My green onions spoiled by the time I made it, so I was unfortunately without, but they would have been there because they are so good on it. You can also do black olives, salsa, and jalapenos, if you want.